Full length recombinant human N-terminal Flag tagged TRIM24 (Tripartite Motif Containing 24) protein, produced in SF9 insect cells. TRIM24 (UniProt/Swiss-Prot entry O15164) is a member of the tripartite motif (TRIM) family. The TRIM motif includes three zinc-binding domains - a RING, a B-box type 1 and a B-box type 2 - and a coiled-coil region. It acts as a a transcriptional coactivator through it’s interaction with several nuclear receptors, including the estrogen, retinoic acid, and vitamin D3 receptors, and coactivators thereby modulating the transcription of target genes. TRIM24 is thought to associate with chromatin. This association depends on histone H3 modifications with the highest affinity for histone H3 that is both unmodified at 'Lys-4' and acetylated at 'Lys-23'. Defects in TRIM24 cause thyroid papillary carcinoma. 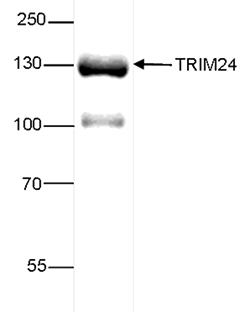 SDS page of the TRIM24 recombinant protein. The position of the protein of interest is indicated on the right; the marker (in kDa) is shown on the left. Diagenode strongly recommends using this:	Recombinant human Tif1 alpha (Trim24) (Diagenode Cat# C23010109). Click here to copy to clipboard.